Welcome to the nanRogue home page. nanRogue is a port of rogue for palm-sized WindowsCE devices, including Palm-sized PCs and PocketPCs. nanRogue springs from my desire to play the classic old roguelike games on my Casio E-105. I've started with Rogue, and will eventually move on to some of the more ambitious games that I enjoy, such as Angband, Omega, and NetHack. If you don't know what a roguelike game is, you may want to check the out some roguelike pages in the Links section. Perhaps later I will include some more information on how to play Rogue on this page. nanRogue is ported by Geoff Dunbar (gdunbar2@prankster.com). Based on rogue 5.3-clone, attributed to various authors. 1/10/02 - nanRogue v0.9 (5.3) released. 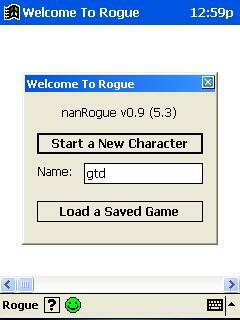 11/7/01 - nanRogue v0.5 released. 11/3/01 - PocketRogue renamed to nanRogue. Turns out someone was calling their Palm Pilot port of rogue "PocketRogue". 10/17/01 - PocketRogue v0.1 released. 10/16/01 - Created the PocketRogue page. Screenshots of nanRogue in action. Downloads of the current version of nanRogue. I've compiled these for Palm-size PC v2.11, so they should work on Palm-size PCs and PocketPCs. I've only tried them on a Casio E-105 and the PocketPC emulator, so I don't know if things will work on other devices, but they might. I have a report the nanRogue works on the iPaq, model 3850.
v0.9 is feature complete, and plays well. I am only waiting for some feedback from users that everything works OK to release it as v1.0. Download the zip files, then look at nanRogue.txt in the zip file for information on installing nanRogue. The source code for nanRogue, available for download. See the contained README.txt for some information about the sources. Rogue for Windows - winrogue My port of Rogue to Windows. "The Winner's Guide to Rogue" - http://db.gamefaqs.com/computer/doswin/file/rogue_a.txt This covers the PC version, rather than the Linux version nanRogue is based on, but most of the information still applies. Also, the direct link may not work due to the hosting site; if this is the case, look around for it.